I would like to disable my wifi signal but in the settings it says something like Broadcast SSID on/off. If I click off will it still be transmitting something just not the SSID? Is there some cheap way of detecting it's transmissions? SDRs don't go that high. That setting doesn't turn off WiFi, it just turns off broadcasting your SSID. A person driving by looking for a WiFi signal wouldn't see it, but someone who knew it was there could still access the WiFi signal. If you have devices that have already connected to that WiFi, they'll remember the connection information even if you turn off broadcasting. So I need to get a regular router and then physically power up the wifi when I need it. Does anybody make a wifi that actually shuts off? What kind of 'sniffer' can I detect it with? Okay, I was hoping somebody with more knowledge than me would chime in and answer your question. Alas, no one has, so I'll give it a try, but remember I'm probably not the best person to be answering these questions. I'm pretty sure there are routers that have a physical WiFi switch, I just don't know which ones. All the routers that I've dealt with have a software switch to turn of WiFi. You have to log onto the router, find that setting, then toggle it on/off. The downside of this is that you'll need a hardwired (Ethernet cable) connection to the router to turn it back on. An alternative solution would be to use a dedicated modem and separate routers. You would need a dedicated modem (one that doesn't have a built in router), a router without WiFi and a router with WiFi. You would connect the router without WiFi to the dedicated modem and then daisy-chain the router with WiFi to the first router. With this method, when you need WiFi you would turn on the router with WiFi, and when you don't need WiFi you would turn it off. There are "sniffer" apps available, but I've never used them and can't really recommend one. From what I've heard, they are just some software that you run on your laptop. I know this probably doesn't help a lot, but maybe by bumping this thread someone with more knowledge than me will chime in. Just turn off the radio. What model and brand of router do you have? There should be a switch in the router firmware to turn off the WIFI signal. It doesn't matter if you broadcast a SSID or not. The network can be seen in WIFI cracking software. To see WIFI you need a HackRF. What they are saying is "disabling" it will continue to transmit RF just not identifiable. I want to shut off all the RF. Can you answer my question on what model/brand router you have please? 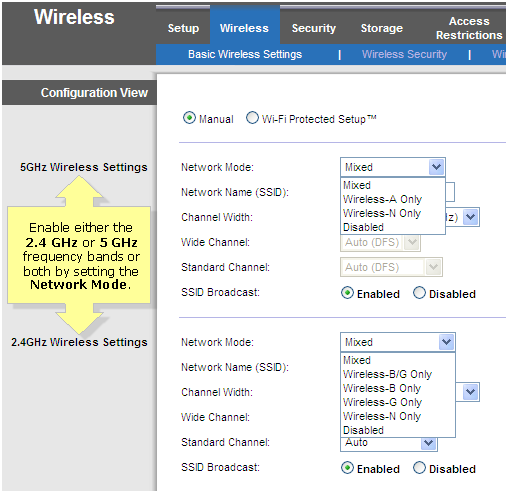 If you go to the wireless settings in the router and select disabled for the network mode that should disable the radio. But I'm not sure if that leaves 5 GHz enabled or not. The only way to test that is to use another computer with WIFI that has 5 GHz capability and see if your SSID shows up or not. No, they said disabling SSID transmission will continue to transmit RF. I said turn off the radio. Do you not see the checkbox in the photo?? There's no check box looking at the manual. It's the option under the WIFI options called "network mode" that needs to be set to disabled. poltergeisty is right, this is how to turn off WiFi on this router. And, FYI, it does disable both bands. But, word of warning - you will need a wired (ethernet cable) connection to turn it back on. FYI, it does disable both bands. When I read this bit I was a little confused. It seems like from what it says that if it's disabled, you still have 5 GHz. Even more cryptic is that it says 802.11 N will be disabled, but doesn't mention 5 GHz but 2.4 GHz. 802.11n can use both bands. It looks like this router has a different set of settings for each band, both of which can be disabled. Oh, now that makes more sense then.